The Chance To Dance program culminates with a FREE community performance at Martin Luther King, Jr. Performing Arts Center with special appearances by pre-professional students from Charlottesville Ballet Academy and professional company artists from the Charlottesville Ballet. Children from six elementary schools will come together on stage to showcase their accomplishments throughout this year’s Chance To Dance (C2D) after school program. C2D students from Charlottesville City and Albemarle County will have the opportunity to perform for their peers, educators, and the broader community, allowing them to take pride in their achievements and develop the self-confidence that results from successful performance. At the showcase, Charlottesville Ballet will present lifetime scholarships for select students who show exceptional talent and passion for dance to train at Charlottesville Ballet Academy. 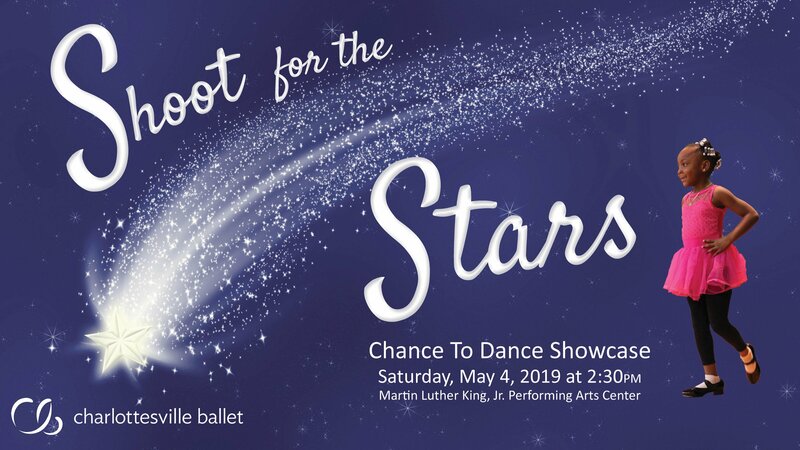 Join us as we celebrate all of our wonderful C2D dancers and shoot for the stars! TICKETS: FREE General Admission; no tickets required! Chance To Dance (C2D) is Charlottesville Ballet’s after-school outreach program for grades K-5 that gives underserved children a hands on experience with the arts. The Ballet partners with local public schools in both Charlottesville and Albemarle County to close the opportunity gap by giving access to dance education through scholarship programs and by fostering a life-long appreciation for the arts.